When my fiance, Jimmy, and I were searching for a home, we had nonnegotiable criteria: a historic place for me, a two-bay garage for Jimmy to store his prized Alfa Romeos. Unfortunately, those criteria don’t usually overlap — a discovery we made after viewing 39 homes in two months. Both in our late 30s, neither of us wanted to cave in to the other’s demand. I lost sleep over the premarital stalemate, waking up in cocoons of sweat after dreaming we had broken up over a stupid house. It had taken me half a lifetime to find this good man. Was I going to lose him over mansard roofs, pedimented gables, and decorative pilasters? I’d be the bigger “man” and give up my dream of a home with a “Circa 1850” sign by the front door. He took us to see it the next day. Despite the refrigerator on the front lawn, the missing shingles on the roof, and the dangling shutters, we fell madly in love with the aging Ashland beauty and its garage. Our adoration didn’t diminish even after finding it was a total wreck. Undeterred, we filled out the paperwork and put in our bid. The next morning brought bad news. Another couple had made a higher offer. As much as we loved the house, we refused to enter into a bidding war. We had set a maximum that would allow one of us to carry the mortgage in the event the other became unemployed. Once again the universe intervened. Bill called. The couple had withdrawn their offer. Two months later, we proudly moved into our new/old house. During one of our weekend fixer-upper marathons, Jimmy yelled from the crawl space above the garage, “Giulietta, come here.” I dashed over from the dining room, where I had been steaming off Army-green wallpaper. Sure enough, it had “JWT” inscribed on it. This might not have been startling, except that Jimmy had played hockey in his youth. Then I remembered the previous owner’s name began with a T and raced to the den to check the mortgage papers. There it was: John W. Thompson. I’m not prone to accept paranormal explanations, but part of me has come to believe the ghostly JWT scared off the other couple’s son so his hockey-playing “namesake” could own the home. This was a smart spiritual intervention; Jimmy has lovingly restored and taken care of JWT’s home, especially the garage that protects the sacred Alfa Romeos. The newest luxury for the rich? Tricked-out garages. Giulietta Nardone, a writer, painter, and karaoke singer, lives in Ashland. 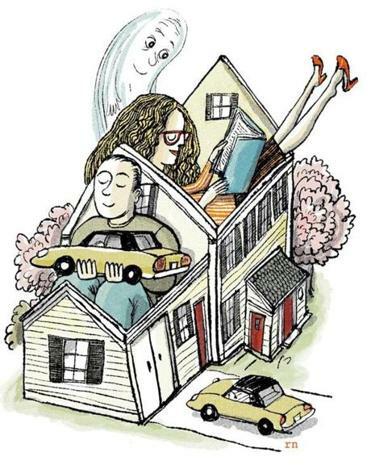 Send comments and your 550-word essay on your first home to Address@globe.com. Please note: We do not respond to submissions we won’t pursue.